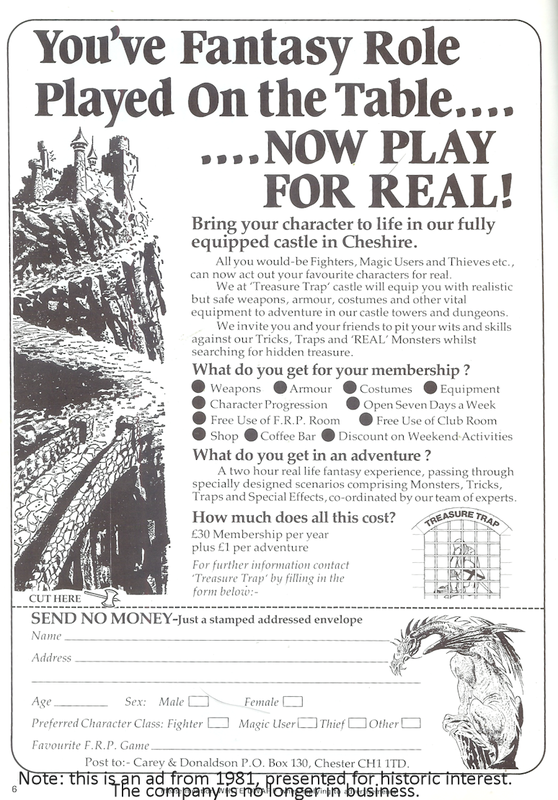 The last entry mentioned the White Dwarf ad for Treasure Trap, the first commercial British LARP, and perhaps the first British one altogether. It ran its first adventure in April 1982. I never visited it – LARP holds little appeal for me, and never has – but friends did, and thoroughly enjoyed it. Some even made their own weapons, made of plastic pipes and foam blades covered with metallic gaffer tape (duck tape, to Americans), and practised fighting on the school playing field. Treasure Trap was, by any standard, an impressive achievement. 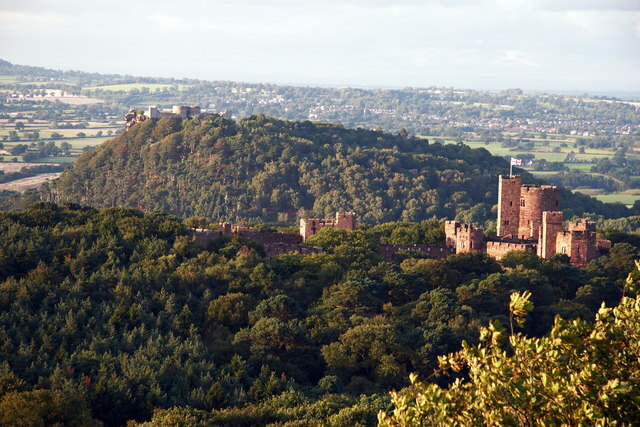 The creators, Peter Carey and Rob Donaldson, managed to hire Peckforton Castle in Chesire to use as their adventure site. Peckforton wasn’t a genuine medieval castle – it was a Victorian reconstruction, built around 1850 – but for LARP purposes (and British heritage) that was probably a good thing. Peckforton Castle in 2006. Picture by Peter Styles (creative commons attribution share-alike licence). PvP was a part of the Treasure Trap experience; outside certain safe areas, players could attack, ambush, steal from and attack each other. One friend who visited told me he’d been on adventure where the party found no treasure (they believed), but ganged up on their Anti-Paladin companion after it had finished, and all the missing treasure fell out of his pockets when they beat him. “I have no idea how he did it,” my friend told me. Lacking any Treasure Trap experience myself, I can’t say much more about it. It apparently had a rules system, though combat effectiveness was apparently a mixture of GM-moderated rules and the actual fighting ability of the player. But in April 1983, a year after it opened, the popular BBC children’s programme Blue Peter visited, sending presenters Simon Groom and Peter Duncan to experience it for themselves. The short documentary they made will probably give a better idea of Treasure Trap than I ever can. This entry was posted in Gaming and tagged live action, old school, Treasure Trap, White Dwarf. Bookmark the permalink. Humph, there was an extensive rule system, that was later adapted and used at Labyrinthe (Chistlehurst Caves) the second commercial LARP system.